That's One Way To Be Creative! Edgar Artis Uses Everyday Items Into Work Of Art! Wow! We’ve never thought of that. Artist worldwide has been posting up their artwork in all sorts of social media platforms. From Tumblr to Pinterest, it seems that the only way for people to notice their work is through this various social media platforms. Yet nowadays, there’s another platform that draws in the audience much efficiently. Instagram is the current popular social media platform for inspiring artist to publish their work and besides, it is easier for them to get exposure. Billions of people are using Instagram and so, artist took that opportunity as well. Artist like this Armenian fashion illustrator, Edgar Artis, who uses stylised paper cut-outs and everyday objects to create beautiful dresses! 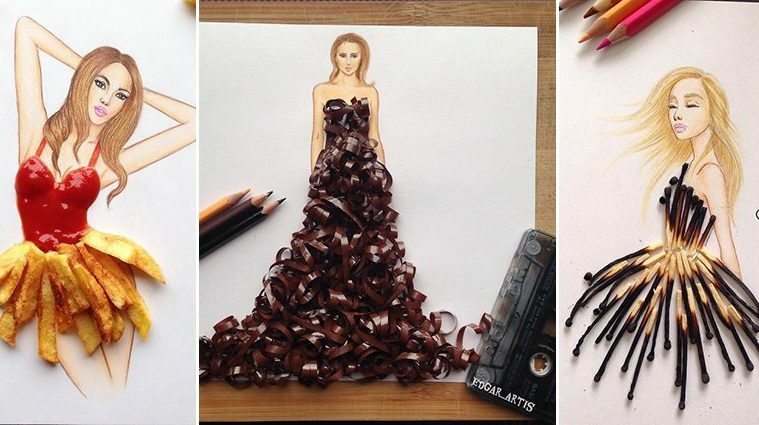 This magnificent artist who has over 500,000 Instagram followers, sketches various dress designs, using the drawn silhouette of a girl-model and dressing her in extravagant attire with stylied paper cut outs using objects of nature or everyday life. Objects such as used matchsticks, aluminum foil paper, and even orange fruit skins! Omgosh! They look so good! The designs take you to another world of fairy tales and princesses no matter what the material he is using. There’s a sense of harmony when they come together creating a fascinating art that is admire by art lovers worldwide. We can check more of his creative artwork in Instagram at IG: Edgar_Artis. This is so unexpected. Never knew that simple everyday items can reuse as a work of art for fashion sketches. We hope to see more of his work in the future.